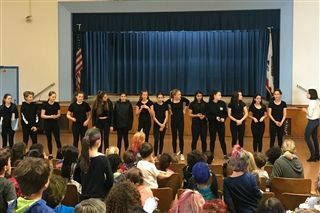 On May 3, Windward’s Middle School Advanced Dance and Windward Repertory Ensemble of Dancers (WRED) visited Richland Avenue Elementary School as part of their ongoing relationship with the school. The visit was the culmination of a year-long pilot program started by Julie Friedrich, Windward Dance Faculty Member and WRED Co-Chair. The program caters to Richland French immersion students ranging from Transitional Kindergarten through the Second Grade, as well as Special Education students in Kindergarten through Third Grade. In the Fall and Winter, Windward Seventh and Eighth Grade dancers performed for the Richland students, showcasing three genres of dance: modern, ballet, and hip-hop. In May, Windward students transitioned from being performers to teachers, spending the final visit of their pilot program leading Richland students through a full dance class, culminating in teaching the Richland students a full section of choreography. The Eighth Graders took the lead, sharing the methods they learned at Windward with an eager audience. The Windward students even offered a French translation to the English instruction for the French-speaking students. Julie says they have plans to return to Richland next school year so that the same group of Windward students can continue the special relationships they have formed throughout their Upper School careers.